Simpsons Fanon was a fanon wiki about "The Simpsons". The logo is a parody of Wikisimpsons' logo. Simpsons Fanon was created with the purpose of promoting Wikisimpsons, the main wiki, as part of the Simpsons network of wikis. User:Smiley12 later designed the logo and favicon for the wiki. The Simpsons Fanon wiki from Wikia had all content moved to the new Simpsons Fanon. 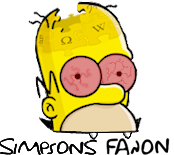 Simpsons Fanon is still under construction, since it is currently focusing on technical aspects of the wiki, such as the logo, main page and other important pages design. On November 27, 2010, all content from the Wikia Simpsons Fanon moved to ShoutWiki's Simpsons Fanon wiki. Simpsons Fanon suffered greatly from ShoutWiki's crash and couldn't be recovered. It then got restarted on simpsonswiki.net. Cook879 became an admin to clear up the vandalism caused the day before. Randomno became an admin so he could try and clean up the wiki, and later became a bureaucrat. The website was finally shutdown. Simpsons Fanon had lots of vandalism in March, all from IPs with similar IP addresses. Modified on March 16, 2014, at 06:38.